Cao Dai is an attempt to create a perfect synthesis of world religions. It is a combination of Christianity, Buddhism , Islam, Confucianism, Hinduism, Geniism, and Taoism. 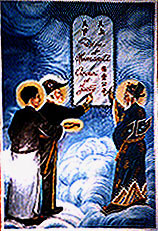 Established in the Southern regions of Vietnam in the early 1920's, the religion was officially codified in 1926. The functioning center of Cao Daism is located in the Tay Ninh province. Cao Dai literally means high tower or palace, a metaphor for the spender of spiritual growth. The central philosophy of Cao Daism pertains to the duty that the faithful perform for themselves, their family, society and the world at large. Much like Confucianism, this element of the Philosophy pertains to how the individual functions within the context of the community. 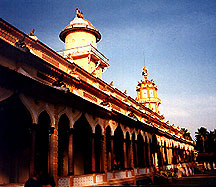 Other elements of Cao Dai philosophy are more clearly influenced by Buddhism and Hinduism. The Cao Dai faithful are expected to renounce materialism in order to more fully cultivate their spiritual growth. Similar to the Buddhist concept of Samsara, the material world is seen as a distraction to the greater goal of enlightenment. Also similar to Buddhist belief is the use of the device of Karma. Cao Daism also reflects some of the more ancient belief systems of worship in Vietnam. Believers are expected to worship God, superior spirits, and ancestors. This spiritualism is reminiscent of the Animism philosophy that had been a part of Vietnam during its earliest times. Cao Dai also utilizes spiritual mediums and channelers. These individuals are an essential part of Cao Dai worship. They offer guidance from superior spirits, departed family members, and other wise individuals. Most of the important cannon of the Cao Dai was gleaned from these spiritual seances. Respected saints of the Cao Dai include: Joan of Arc, Rene Descartes, William Shakespeare, Victor Hugo, Louis Pasteur, and Lenin. The clergy is made up of men and women. 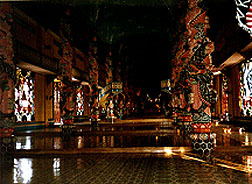 The entrances of the temple are divided by gender, men on the right, women on the left. The priests practice spiritual purification including meditation, prayer and vegetarianism. They believe that consuming meat not only pollutes the body, but hinders other life forms during their quest for enlightenment.